I got a cheap ikea NOID phal 2 years ago from IKEA. 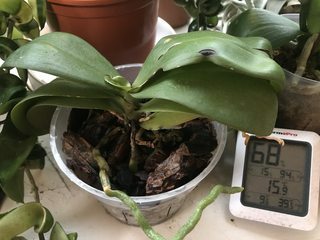 It did well for about a year, put out new roots and even rebloomed. Since then however, it's been constantly sick - I treated aggressively for mealy bugs which kept coming back by the week with soap and isopropyl dabs, and it has now been mealy bug free for two months. 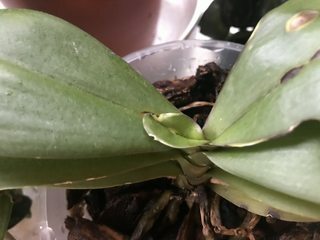 However, it started growing a new leaf very very slowly, and i notice it looks deformed and discolored. does anyone have any guesses as to what is causing this, and what I can do to help it get back to a healthy state? Any advice is appreciated. I'm at my wit's end! The crown, although deformed looks healthy. I had a lot of Phallies in my collection get a fungal infection last winter after having slugs having a feed on the leaves. I treated it heavily with systemic treatments and have eradicated it luckily. I have no idea how the little buggers got in, but hit the inside perimeter of my warmhouse with saltpeter, THAT did the job. Since then, the leaves have looked like yours, but, as long as the crown is in good condition, the plant will start producing some healthy leaves, it just takes a bit of time. This is after 6 months of TLC.